There is something amazing that happens as I open God’s Word in the morning and just read it. Some days it’s simply one chapter, other days I’m pulled into a story and blow through five or six. If you haven’t ever accomplished reading His story, I challenge you to try it. Don’t pressure yourself with a plan, just crack it open and see where He leads you. This week it returned me to one of my favorite stories. It occurs in 2 Chronicles 20 and stars Jehoshaphat, King of Judah. Jehoshaphat was facing a battle with some big people, a “vast army” to be exact. I can relate? You? Well Jehoshaphat sought the Lord and I love what happens here. Before I move onto what Jehoshaphat and Judah did, I want to point out something—the battle was never theirs. Did you see that? God tells them it’s His battle, they didn’t need to fight it. Sometimes we get locked into fighting a battle that was never ours to take up. We can’t understand why we feel defeated, yet we aren’t even supposed to be in the fight. So what should we be doing, if not fighting? Do you see? See the power of our praise? 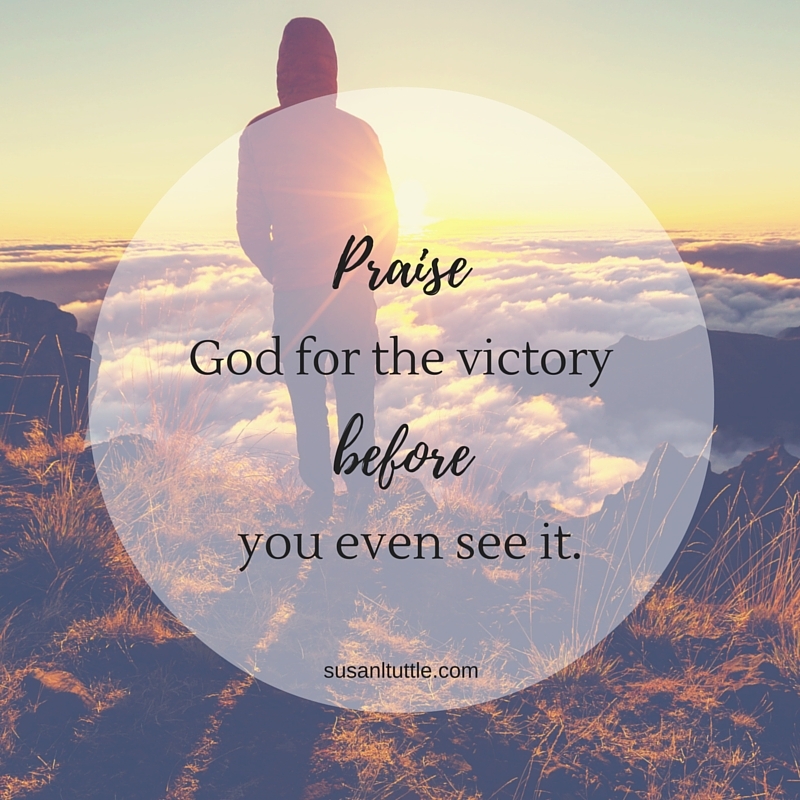 So often we try and take the battle from God and all He wants is our praise. As we praise, He moves. There is such power in the simple act of worship. And where did this praise occur? In front of the battle! Before the deliverance even happened, they praised God for the victory. OH! How I want to be someone who praises God for victory before I see it. Are you fighting a battle today? Seek God…is He trying to tell you that the battle is His? Step back from the fight and start praising—let Him defeat your enemy. The battle belongs to the Lord. Thank you for sharing this truth, Susan. I needed the reminder and the encouragement. :) So did I, Beth. You are so welcome, friend.